A fine rare older genuine Northwest Coast Kwakiutl Indian hand carved and painted cedar mask. The mask is carved by master carver. Masks are extremely rare to find by this highly sought after artist. 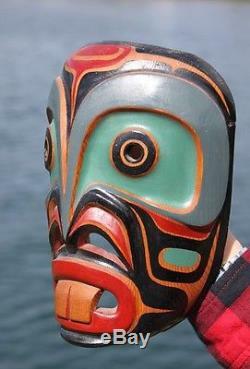 The mask depicts Bukwis or chief of the sea in Kwakiutl lore and bringer of wealth. The mask measures 8 1/4" x 6" and 3 1/2" D and is fully inscribed to the interior " 1983 Bugwis Man of the Sea Henry Speck Hopetown. The mask is in good condition with a small chip noted to the chin on the underside and not really noticeable on display. The mask makes an excellent display item and a fine addition to anyone's collection. Please check out other current offerings including a great Tlingit, Haida, Tsimshian and Kwakiutl totem poles, many historic baskets de-accessioned from museum collections including Salish, Haida , Tsimshian , Cowlitz and Tlingit examples. Also some great early Inuit carvings. More than just a pretty picture. FREE scheduling, supersized images and templates. Over 100,000,000 served. Get FREE counters from Vendio today! The item "FINE RARE OLDER NORTHWEST COAST KWAKIUTL DANCE MASK CHIEF HENRY SPECK" is in sale since Friday, January 08, 2016. This item is in the category "Collectibles\Cultures & Ethnicities\Canada\ Aboriginal". The seller is "richmojoe" and is located in Northwest Coast.